Have you checked the Crafty ribbons inspiration blog for your chance to win one of the amazing prizes from our sponsors? No? What are you waiting for?! Hop, hop, check the blog out. ;) Today we are again sponsored by Ali and Tony from Crafty ribbons and here's the awesome prize they are offering to the lucky winner. I have another non Christmas card to show you today. The sentiment on this card is one of my favourite quotes. I think it's very true. If you truly believe in yourself, you can do anything. This is a Stempelglede stamp. I had quite some troubles getting my hands on it, but with the help of my sweet friend Charlotta I got it. 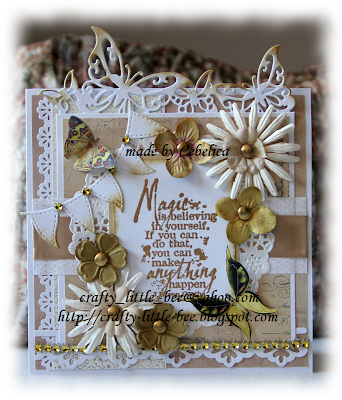 :) I embossed the sentiment with Queen's gold embossing powder from Ranger. The papers are from my stash. I cut the butterflies out from Artsy collage's Nature collage kit. Butterfly die is from Joy Crafts, border die I used on the bottom of my card is from Spellbinders and banner die is from LLLC. The tan satin ribbon is from Crafty ribbons and flowers are from my stash. In the middle of each flower I put a gold brad.On the bottom of my card I also used crystals that were cut from a gold mesh. I used the same crystals on the banner as well. Your creation is just stunning Cebelica. Just beautiful! I love all the wonderful details and the awesome color palette! Thanks so much for dropping this off by our house here at 613 Avenue Create! Stunning and fabulous card Cebelica! Omg Cebelica, your card is Amazing hun! Thanks for playing with us, a big hug, Franz. Adorable card! I love all the embellishments. Nice job! Thanks for playing at Crafting from the heart. We hope to see you next time. Good luck. Hello...Just poppin by to say Thank you for all you fabulous DT creations for CR and all the extra work for Mandy's Christmas event. What a lovely golden card. The dies and the golden touches are sweet. Thanks for joining us at Simon Says Stamp Monday Challenge. Ooh this is simply STUNNING! Love all those beautiful dies!!! Hope you and your family had a lovely Christmas! Beautiful creation, Thanks for sharing a BMC.